HOT DEAL: Hamanasi special, Lowest prices in Years! Save $637, includes Free diving, meals and airport transfers. Get your Free Quote and Save today! 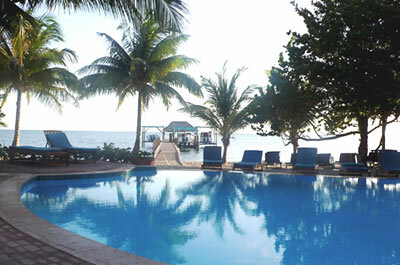 Price Includes: Includes 7 nights beachfront room accommodations at Hamanasi Resort, roundtrip airport transfers to BZE/Dangriga, continental breakfast, lunch and dinner daily, and 5 days of diving and/or adventure tours. Entering Hamanasi is like entering a dream. The spacious, casually elegant accommodations feature gorgeous Belizean hardwood furniture, air conditioning, ceiling fans and private porches. Your colorfully tiled bathrooms have plenty of space and plush, thick towels. Enjoy a peaceful night’s sleep on fine linens, comfortable mattresses and soft pillows. As an added convenience you get ample bottled water in all rooms. Escape from everyday life and leave behind the stress of hectic lifestyles. Hamanasi has 5 different room types: Deluxe Private Tree House (1), Private Tree Houses (9), Honeymoon Suites (2), Beachfront Deluxe Rooms (2), and Beachfront Rooms (8). Belize boasts the Western Hemisphere’s largest Barrier Reef and 3 of the Caribbean’s 4 atolls. Hamanasi is a PADI 5 Star Gold Palm Resort, and offers a full range of diving instruction. If you choose to get certified, Hamanasi can hook you up with PADI certification upon course completion. It includes courses, equipment, required dives and certification cards, and all necessary PADI course books and study materials. Hamanasi’s goal is to provide an exceptional diving, snorkeling or fishing experience in a safe atmosphere. Your Belizean Tour Guide accompanies you on all reef adventures and a PADI instructor accompanies all dive trips. Tanks, weights, belts, entry fees, juice and cookies are included in rates. Lunch is included on atoll trips. All major dive certifications are accepted. Be sure to bring your card you unless you are participating in a Discover Scuba or Open Water Course. Gear storage is free of charge. Your staff will carry all gear to and from the boats if you so desire. For your safety there is a nearby recompression chamber on Ambergris Caye. So prepare to get some excellent low impact exercise, enjoy sunny warm days and spend time living with the other 2/3rds of the Earths creatures. Tantalize your taste buds in the restaurant at Hamanasi! Dine in casually elegant surroundings either inside the Great House, on the veranda or outdoor deck. Every effort is made to find ingredients of the highest quality and have them delivered pure and fresh. They serve scrumptious international cuisine with a Caribbean twist. If you are vegetarian, vegan, or have any special dietary requests be sure your review the vegetarian menu for your favorite selections. Hamanasi will bend over backwards to accommodate your needs! Breakfast is served from 6:30 – 9:30 AM. Continental Breakfast Buffet includes fresh juices, coffee, tea, homemade bakery items, tropical fruits, eggs, cheeses, yogurt, cereal and granola. Lunch is served from 11:30 AM – 2: 30 PM. The lunch menu offers a variety of Belizean and Carbbean regional favorites. Dinner is served from 6:30 – 8:30 PM. Dinner boasts a choice of appetizers, several main courses and dessert accompanied by home baked bread. Each menu includes a seafood, vegetarian and meat dish. Enjoy breads, soup or salad, one main course, dessert, coffee and hot tea. Throughout the day take advantage of the bar service! Taste an extensive selection of spirits, cocktails and wine. Enjoy ice-cold Belikin beer, and their very own Hamanasi Hurricanes, Pina Coladas and Margaritas! Relaxing by the pool? No problem!